PANGU Pati Leader, Sam Basil, is now the Minister responsible for Communications, Information Technology and Energy. 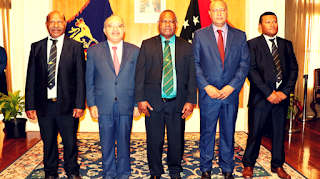 This follows today’s realignment in ministerial portfolio allocations by Prime Minister Peter O’Neill. The changes in portfolios will strengthen the National Government’s focus on key growth sectors that will have a direct impact on business development and community advancement. "Minister Basil will be responsible for the energy and communications sectors that are crucial for growing a modern economy,” the Prime Minister said in a statement. "I have great confidence in the minister's capacity to meet both the challenges and opportunities that our country faces in these areas. "There are clear synergies between the energy and communications sectors brought about by technological advances that are enabling Papua New Guinea to deliver positive change not only in urban areas, but also in rural and remote areas. The Prime Minister thanked outgoing Communications Minister, Francis Maneke, for his service as Minister and expressed his appreciation to embrace the Cabinet reshuffle. “Ours is a Coalition Government in which we must have representation in the Cabinet for all partners in the Government. “There is a set number of Cabinet positions available, and I thank the Honourable Member, Francis Maneke, for placing the interests of the Government and the Nation above all else. “He is a very capable Member and Minister and has a strong ministerial future in the years ahead. "In our system of Government it is essential that we continue to evolve Cabinet and Ministerial allocations in the interest of ensuring consultation and diversity of representation.